With the evolution of mobile technology, lot of user surf internet on mobile phone and tablets. In fact, if you look at the current trend then numbers of such users are going up at a tremendous pace and it will be huge in next few years. In fact, don’t get surprised if things like desktop and laptop become obsolete in next few years. If you are a blogger or internet marketer then you should start preparing for the future if you haven’t done that so far. Response theme or mobile response theme is same, these are themes which can adjust their width and other parameters based upon your users screen display. So your site is compatible with a desktop, laptop, mobile phone and tablet. Your users get same high quality experience irrespective of the device they are using to access your blog. As these are relatively newer concept, you need to have a careful look at your wordpress or blogger based blog’s theme to figure out if it is mobile responsive and html5 compatible. In this post, I will be taking you through some of the best wordpress responsive theme. Eleven 40 Pro – first theme in best wordpress responsive theme category is the eleven 40 pro theme from studiopress. My blog is currently using it and you can try to access my blog on different devices to see how it functions. Studiopress themes are best for wordpress as they are light-weight, mobile response and seo friendly. Eleven 40 theme is one of the best wordpress theme available in the market as it is not only mobile responsive but also, html5 compatible. Magazine Theme from studiopress themes– it is one of the highest selling theme from studiopress which is ideal for blogs and news based site. It is mobile responsive and loaded with features like widget, custom background, custom header and it has got 7 color styles to suite your need. Like all other studiopress themes, it is also seo friendly and comes with lots of genesis plugins which can be used to further enhance your blog. Lifestyle theme – lifestyle theme from studiopress is another mobile responsive theme which is a serious contender for best wordpress responsive theme. As mentioned earlier, it too has got many features. All studiopress themes are mobile response but I am only talking about those which are highest selling theme from them. So you don’t have to bother if you have got your eye on some other sutdiopress theme. They all are equally good and individual taste will always vary. 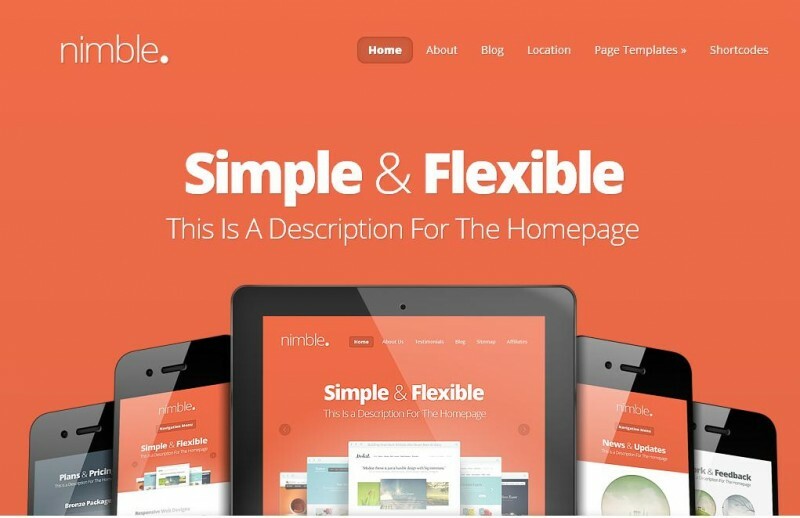 Nimble from Elegant Theme –nimble is another awesome mobile responsive theme from elegant themes. Elegant theme club is one of the best wordpress theme club. You get access to more than 80 themes in $39. So if you don’t like one, you can always try some other. There is only one word to describe nimble theme and that is “Beautiful”. 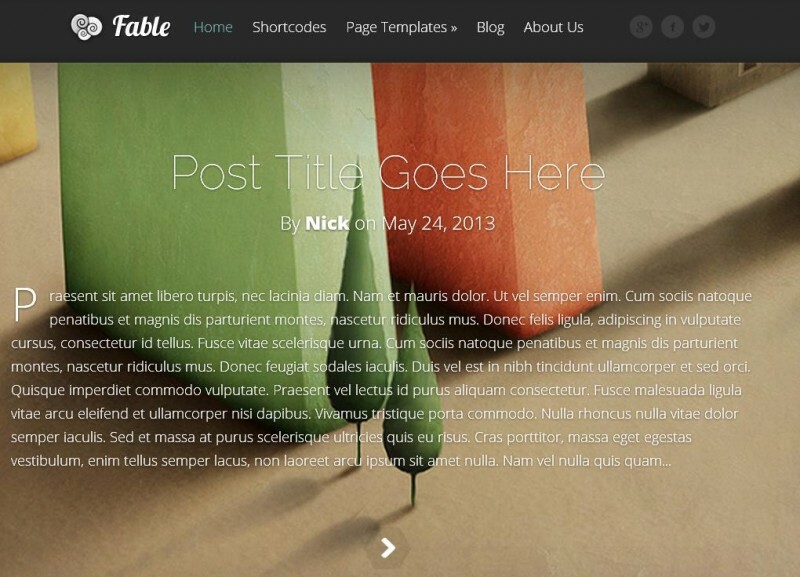 Fable theme – fable is another best wordpress responsive theme. It is built for bloggers. Your content is focused with this beautiful design while encouraging your visitors to spend more time on your blog. Its spacious, full-width, and long-format style makes scrolling a pleasurable journey. These are some of the best wordpress responsive theme. You can’t go wrong with these themes. They are seo friendly, well coded to optimize performance and loaded with features to ensure that you get what you need to run a successful wordpress blog. WordPress is one of the most popular CMS and with these themes, you can take it to the next level where you blog is future ready and compatible with all kind of devices. I’m a newbie when it comes to using WordPress. This post will surely help a lot and would save me a lot of time from doing the research on my own. Thank you for such detailed information.